Guinea pigs are excellent as a model system for asthma, since the airway physiology and pathophysiology of asthma is very much comparable to that in humans. The allergen of choice in these models is ovalbumin. Influx of inflammatory cells, notably eosinophils, and expression of pro-inflammatory cytokines. We can test the effectiveness of your compound against these parameters. We have previously demonstrated efficacy of bronchodilator drugs (β2 agonists, anticholinergics, Rho-kinase inhibitors) and anti-inflammatory drugs (glucocorticopsteroids, arginase inhibitors) in this model. A unique feature of this model is that guinea pigs can be instrumented using a balloon catheter to measure lung function online in freely moving unrestrained animals. This way, not only hyperresponsiveness to histamine, but also the nature and size of the early and late asthmatic response can be measured including effects of pharmacological treatments hereon. This can be done without the need for surgical interventions during the treatment period, without the need for anaesthesia (which effectively blocks the neural component of airway hyperresponsiveness) and with the possibility of repeated and on-line measurements in time. Furthermore, the guinea pig offers a number of unique characteristics that make the model highly suitable as an asthma model and superior to rodent models such as the mouse and rat. The guinea pig has both early and late asthmatic responses and the mediators that govern airway smooth muscle tone and ultimately determine airway responsiveness in these animals are more comparable to the human situation than those found in mice (e.g. histamine release from mast cells, eNANC and iNANC neurotransmission). – Smit M, Zuidhof AB, Bos SI, Maarsingh H, Gosens R, Zaagsma J, Meurs H. Bronchoprotection by olodaterol is synergistically enhanced by tiotropium in a guinea pig model of allergic asthma. J Pharmacol Exp Ther. 2014;348(2):303-10. – Santing RE, Olymulder CG, Zaagsma J, Meurs H. Relationships among allergen-induced early and late phase airway obstructions, bronchial hyperreactivity, and inflammation in conscious, unrestrained guinea pigs. J Allergy Clin Immunol 1994;93:1021-1030. 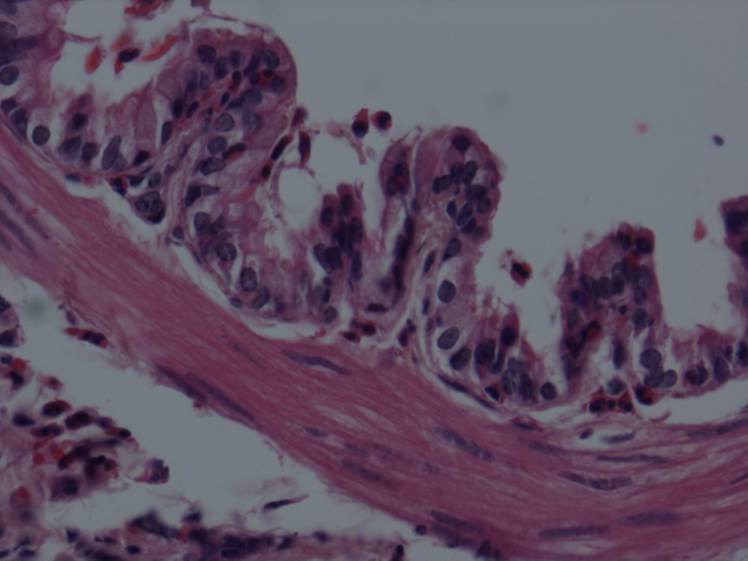 We have previously demonstrated efficacy of anticholinergics, glucocorticosteroids and arginase inhibitors against allergen induced remodeling using this model and can test your compound in a similar way. 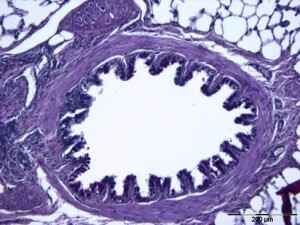 A clear advantage of the guinea pig is that both cartilaginous (large airways) and non-cartilaginous airways (small airways) can be identified which show differential characteristics of inflammation and remodeling, which is also observed in humans and cannot be modeled in mice. Further, mucus gland hypertrophy, an important component of mucus hypersecretion in humans, can be studied using the guinea pig. – Kistemaker LE, Bos IS, Menzen MH, Maarsingh H, Meurs H, Gosens R. Combination therapy of tiotropium and ciclesonide attenuates airway inflammation and remodeling in a guinea pig model of chronic asthma. Respir Res. 2016;4;17:13. – Bos IS, Gosens R, Zuidhof AB, Schaafsma D, Halayko AJ, Meurs H, Zaagsma J. Inhibition of allergen-induced airway remodelling by tiotropium and budesonide: a comparison. Eur Respir J 2007;30:653-661. – Gosens R, Bos IS, Zaagsma J, Meurs H. Protective effects of tiotropium bromide in the progression of airway smooth muscle remodeling. Am J Respir Crit Care Med 2005;171:1096-1102.